The Packard 180, as it is sometimes known, is more correctly called a Custom Eight Super One-Eighty. 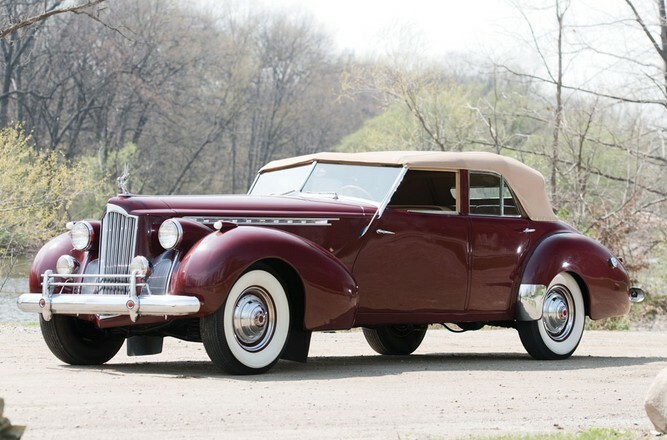 The model was new for 1940 and was Packard’s top-of-the-line offering. The chassis and engine were the same as the One-Sixty, but the One-Eighty was more luxurious. It was essentially a replacement for the ultra-grand Twelve. The engine is a 5.8-liter straight-eight making 160 horsepower (which was more than Cadillac’s V-8 in 1940). A number of different bodies were offered, but Howard “Dutch” Darrin’s are perhaps the nicest of all Packards produced immediately prior to WWII. This four-door Convertible Sedan is quite a bit rarer than any of its two-door counterparts. It is estimated that less than 20 Convertible Sedans like the one you see here were built and only nine remain. This car was sold new in Illinois. The restoration was completed in 1994 and the car was soon acquired by Otis Chandler. It now comes from the Richard & Linda Kughn collection with a pre-sale estimate of $225,000-$300,000. It’s incredibly rare and one of the more gorgeous four-door sedans you will ever see. You can see more here and check our more from this sale here. This entry was posted in Uncategorized and tagged 180, 1940, auctions, cars, classic cars, convertible, custom super eight, darrin, one-eighty, packard, rm auctions, sedan by classiccarweekly. Bookmark the permalink.